A roomy compact sedan, the fuel-efficient 2018 Nissan Sentra is perennially popular with first-time car buyers and budget-minded consumers looking for a sporty 4-door. Now in its seventh generation, Nissan offers the new Sentra in a wide range of models including the fun-to-drive SR Turbo and the Sentra Nismo, which is a factory-tuned performance sports sedan with 188 horsepower. Very good starter car for teens and young adults. Small and gas efficient. There are no problems with my car. It is performance is outstanding!! It gets 30 mpg so you do not have to get gas every week or so. I get gas every 2-3 weeks. Very reliable, more of a starter car for teens and young adults. It is a compact that fits 5, adjustable steering wheel, adjustable seat moving forward and backward towards the steering wheel, and most of all my favorite is that the seat moves up and down. I am very short and cannot see over the steering wheel in most vehicles, this is prime. They have heated seats in the front. There are two USB ports in the back of the middle console for passengers to charge their electronic devices. 7 speakers all around the car. Cruise control is pretty cool. You get to a speed you want and set it at that speed, then it will slow down or speed up based off of the car in front of you, and has automatic stopping when to close to another car. This car does that even when no on cruise control, it has a beep that sounds when your going to fast and there is another car in front of you and your not slowing down enough. If you do not slow down it will emergency brake for you. Nissan Sentra tops Honda Civic. I previously leased a Honda Civic 2015 and I prefer my Nissan Sentra 2018 so much more. The steering wheel on the Sentra is so light and steady compared to the Civic which makes turning so effortless. One of my favorite things about my new car is the quality of the Bose speakers installed, it sounds amazing! I love blasting my music and it makes the drive so much more enjoyable because the sound quality is excellent. A couple of things I do not particularly love about the Sentra is how loud the engine is when I press on the gas. Another aspect to be improved on is gas mileage. My 2015 Civic definitely had better gas mileage than the Sentra. I live in southern ca and with the gas prices here, I typically spend $35 to $40 for a full tank. Nissan: is a good car to use! Nissan is a good car. It has sports, eco, and normal mode. We love it. My wife loves it. The only thing with Nissan is that it is harder to fix than Toyota and Honda. It is harder to fix a Nissan because of your access to the parts, let's say the starter, I fix some parts of my car, when I changed my old Nissan/Infiniti's starter, I had to go under the car and try to access the starter whereas in Toyota/Honda, you can easily access it from the top. Overall, I would give a 4/5. Since it is brand new and no need to do any fixings right now. The performance is good. Maybe I would have to do some adjustments to my rpm and bring it to the dealership and do some maintenance on it. Review: Forget The Versa! 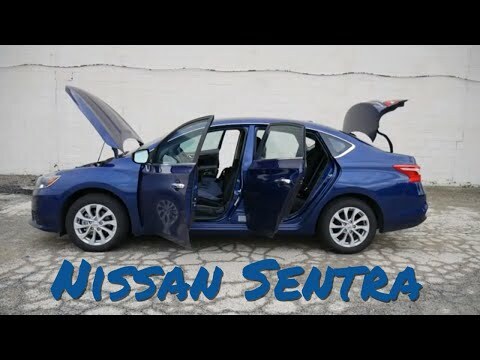 The 2018 Nissan Sentra Is BEST!